Preheat grill to medium-high. Slice radicchio through core into eight slices. Soak radicchio in cold water for at least 20 minutes (or more to control bitterness). Dry on paper towels. In a small saucepan reduce balsamic vinegar and honey to a syrup consistency, set aside. Coat radicchio with oil. Grill evenly on both sides until tender. Salt and pepper to taste. Serve with a drizzle of balsamic glaze. Substitution: Treviso can be substituted for radicchio. Cut Treviso through the core into 4 pieces. 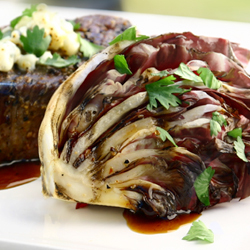 Tip: Grill the thin ends of the radicchio leaves away from the heat over the top of a strip of aluminum foil.